Tree Broom Heath ( Monotoca elliptica, ERICACEAE ). The caterpillar pupates in an loose white cocoon. 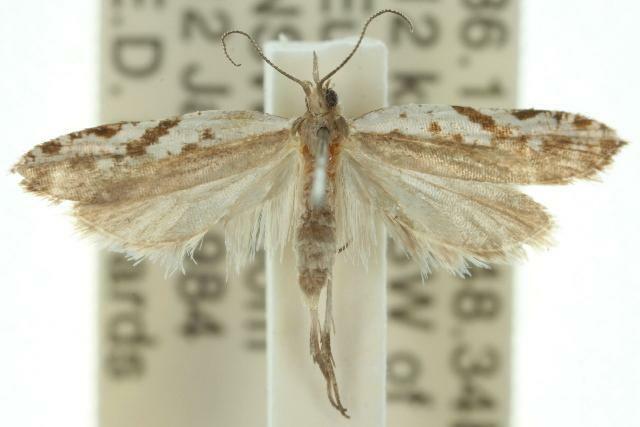 The adult moth has forewings, each with an off-white costal half which has a brown diagonal band and a variety of brown spots. The hind half of each forewing is plain pale brown. The hindwings are pale brown. The moth has a wingspan of about 1.2 cms. Volume 32 (1907), p. 138, No. 272.